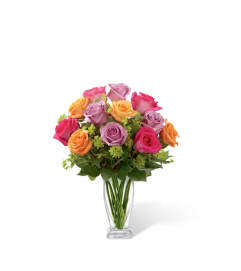 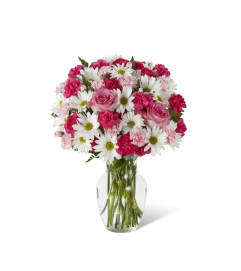 The FTD® Pure Perfection™ Bouquet exudes a bright beauty and bold sophistication to send your sweetest wishes to friends and family near and far. Hot pink roses, carnations, mini carnations and gerbera daisies are accented with brilliant blue iris and lush greens to create a fascinating flower arrangement. 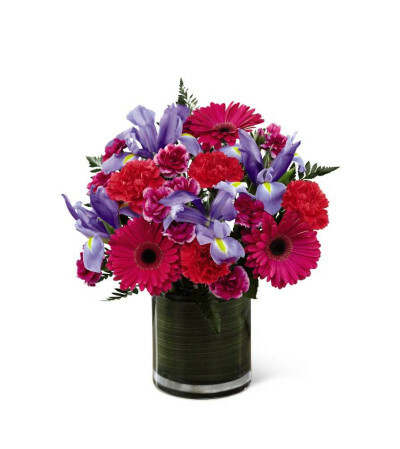 Presented in a clear glass cylinder vase lined with a ti leaf green material to give it an elegant and finished look, this gorgeous bouquet is set to make that perfect impression in honor of a birthday, anniversary, or as a way to express your congratulations or thank you sentiments.